May 21, 2016 – One week ago today thousands of registered democrats in Nevada joined one another in a ballroom at the Paris Resort in Las Vegas. Excitement was in the air at 7:30 a.m. as people checked in, and received their credentials. The day had begun 30 minutes ahead of schedule while delegates were still in line. Motions were put forth by the chair, and blocked by voice vote, yet confirmed by the chairwoman regardless. All alternates were converted to full delegates and seated with new credentials. Then the first count of delegates was given to a confused audience, while long delays without explanation or any activity plagued the day. The second delegates count was off by 64, making sense to anyone with basic counting skills. Sanders delegates were erroneously discarded from the rolls for unclear reasons, and only 6 of the 64 purged were given any chance for a Board of Elections hearing or to offer simple proof of incorrect records. Delegates who had been elected at the county level (and registered and accepted by the same committee on April 2nd) were miraculously missing or had altered voter registration by the day of the state convention. This information was given to us by a member of the credentials committee, against the desires of Chairwoman Lange. A motion was put forth for recount, and ignored. Demands for constitutional democracy were met with anger, hostility, or outright avoidance of the topic by the staff and chairwoman. A motion was put forth by Erin Bilbray, Nevada Super delegate, to end super delegates…this was not only ignored, but the convention was brought to an end in the middle of this motion by the chairwoman, Roberta Lange. The anger was palpable, but the violence? Created entirely in the head of someone nefarious. The room had over 800 Sanders delegates and less than 300 Clinton delegates after 14 unnecessary hours of waiting for motions during thwarted democracy. Roberta Lange had called law enforcement to enter the back of the room moments before she banged the gavel and ran. If there were any violence, there would be a police report. The only arrest relevant to this campaign actually happened not in Sin City but in Atlanta over the weekend, when actor Wendell Pierce was arrested for assaulting two Sanders supporters. What has happened in the last week since the Nevada Democratic Convention went up in a steaming pile of Roberta Lange? 1. The Nevada DNC claimed violence by Sanders supporters. 2. The National DNC Chair claimed violence by Sanders supporters. 3. 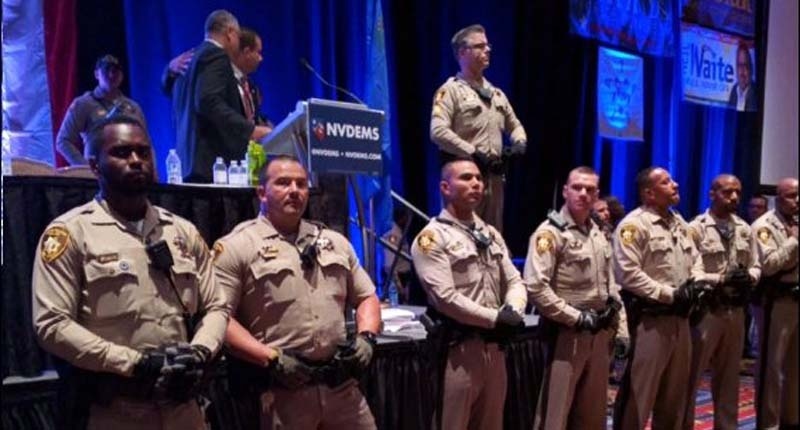 The local media in Las Vegas claimed violence by Sanders supporters. 4. Sanders issued a statement condemning violence if there was any, but stating there was none. 5. The National DNC Chair claims Sanders condemnation isn’t enough…for something that didn’t happen. 6. Memes went around with photos of a person having a blood sugar related medical emergency at the convention The photos were used claiming that there was violence because an EMT was present. 7. Memes of a gentleman holding a chair claiming that there was violence have also surfaced. 8. Clinton told mainstream media that she IS THE CANDIDATE and that there is no way it will not happen, and its essentially done. This is where it has began to unravel. 9. Mainstream media and politicians have begun to turn on DNC Chair Debbie Wasserman Schultz in response to her actions and lies about the Nevada Convention and her fingerprints all over states with active voter suppression lawsuits. 10. Nevada DNC posts a press release mocking and belittling Sanders supporters, claiming that we don’t understand math. I’ve been doing math for a living for over 15 years, they will have to try another flavor of bull. How many examples of violence occurred? None. How many inappropriate or criminal acts were done by DNC staff? Aside from voter fraud, there are many, now part of a class action lawsuit in Nevada. The convention was tweeted, live updated, and covered all day. If a guy had thrown a chair, I, as well as many others, would have posted video. A guy did hold up a chair out of frustration at one point, and if you watch the video you will see he is overcome with emotion as he sets the chair back down and HUGS THE PERSON NEXT TO HIM. Police were present. If there was any violence, as previously mentioned, there would be a paper trail validating its existence. Instead, we have continued mistruth and leading the blind from the democratic leadership. What have we spent the last week doing? Defending ourselves from an entirely contrived story, instead of phone banking, canvassing, donating, or volunteering. We have wasted a week of campaign just responding to the extremely articulate manure spread gleefully by the democratic party on a national level. Clinton has slithered down once or twice from her perches to take stabs in interviews. Sanders is holding rallies for thousands daily as he continues on with no fault. The establishment is scared. They have realized we are paying attention, and that falsehoods spewed against the Sanders campaign only come back to haunt the Clinton camp. What do we have going for us as diligent Sanders supporters? Everything. Our media is not beholden to advertisers or paychecks. It is generated by ourselves. We don’t write advertorials or roll over for sponsors. We write the most powerful thing possible, accurate events. We Facebook, Twitter, reddit, and make sure our signal is boosted so that reality reaches as many as possible. The status quo Democratic Party is so shaken by a platform of peace, helping one another, and equality they are attempting to destroy it before it exists, simply to hold imaginary power they created themselves. Sanders supporters are demonstrators, hippies, and lovers…trying to take us down as violent psychopaths is as unreasonable as the Bernie bro myth they created months ago. Distraction is their goal. Winning is ours. Four marching rallies have been permitted in Philadelphia for the National Convention while the national party leadership has staffed 72 of the 75 National Convention positions with Clinton supporters as they continue to stack the deck against Sanders. What can we do now? With Clinton the Warmonger ready to burn down the democratic party to take the position she feels entitled to, it is time to be present. We call California, we ask the campaign where we can help, we phone bank, pass out t-shirts, and change the world. Sanders will exit the convention as nominee, or the democratic party will choose to break itself into a million pieces for the least liked candidate in history. Buy your plane tickets, makes your signs, get your hotel rooms…we’ll see you there.